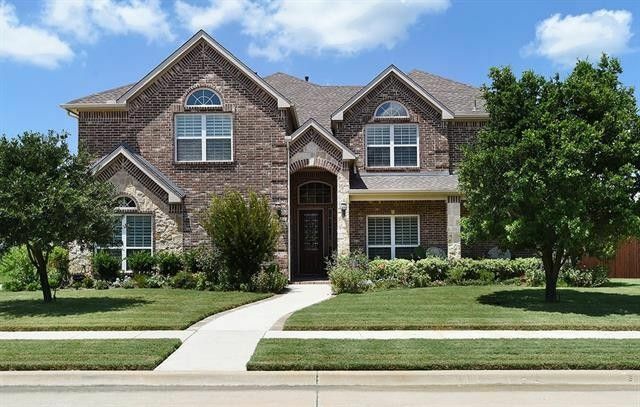 This stately brick & stone home offers comfortable elegance from the covered front porch to the large covered back patio with outdoor living space & its own fireplace. Stunning wood floors flow throughout most of the 1st floor's rooms complemented by the curved staircase & dramatic Plantation shutters. Open floor plan--the kitchen with granite countertops & stainless steel appliances is open to both breakfast area & family room with soaring ceilings & a 20 ft. stone fireplace. The large secluded 1st floor master suite sits adjacent to a private study with French doors. 5 bedrooms, 4 full baths & an upstairs gameroom leading to the media room with built in refreshment bar. Split 3-car garage. One-third acre lot! Directions: From I-35 E, take the Post Oak-Lakeview Exit toward the Preserve of Pecan Creek. At first intersection, Shady Shores Rd., turn right. Turn right into Oaks of Corinth community. The home is on the corner to the right.